As usual the final weeks running up to the San Diego Comic-Con are always among the busiest times of the year for me. Between juggling my client work and personal, getting new work ready for the show, everything, it's always a perfect storm of pre-SDCC blog abandonment. I will finish the series of posts on my Flight 8 story, The Clockmaker's Daughter when I get back from the show. 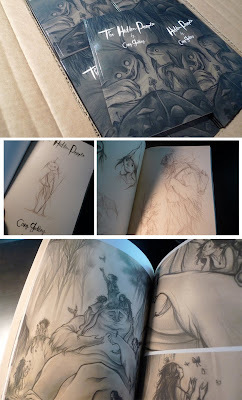 In other news, my 2011 sketchbook, "The Hidden People" have arrived! They look perfect. Absolutely perfect. The Hidden People will debut at SDCC. The 40 page, color printed book will be available at the Flight booth #2235. I'll have them on my shop August 1.